Evan Colmenares is a final-year student pharmacist at the University of North Carolina at Chapel Hill Eshelman School of Pharmacy. Prior to attending pharmacy school, he graduated from the University of Alabama at Birmingham with a Bachelor of Science degree in Chemistry. Evan has been actively involved in the American Pharmacists Association – Academy of Student Pharmacists at a local, regional, and national level during pharmacy school. Evan served as the APhA-ASP Region 3 Delegate, and currently serves as a member of the APhA-ASP Policy Standing Committee. 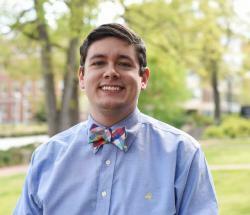 Outside of APhA-ASP, Evan has served as President of Phi Lambda Sigma, President of the Recruitment Ambassadors Program for the pharmacy school, and as his class’s Vice President. In addition to these organizations, he has been an active member of Phi Delta Chi as well as the American Society of Health-System Pharmacists. Evan’s passion for both healthcare policy and improving patient outcomes through the medication-use process has led him to pursue further education in pharmaceutical outcomes and policy. Upon graduation, he is enrolling in a PhD program within the Division of Pharmaceutical Outcomes and Policy at the UNC Eshelman School of Pharmacy.